Photo courtesy of Mike Repp. "Just a few years after the Burlington Northern F-Units were retired that were often used on this line, I discovered the CW or Central Washington branchline along the pursuits of my railfan adventures. This line's primary function was to provide Eastern Washington grain growers the rail option of shipping their grain to market. This is a former Northern Pacific route that split from the NP mainline at Cheney, WA and made a broad semi circle through the Columbia Plateau passing through the communities of Davenport, Coulee City, Wheeler and rejoining the mainline at Connell, WA. Sometime in the mid 70's BN truncated the line between Coulee City and Wheeler. The line features very light rail and up into the early 80's was restricted to only 40 foot boxcars. During the mid 90's when BN was rationalizing marginally profitable branchlines the CW was discarded by BN and I believe the State of Washington now owns the track. 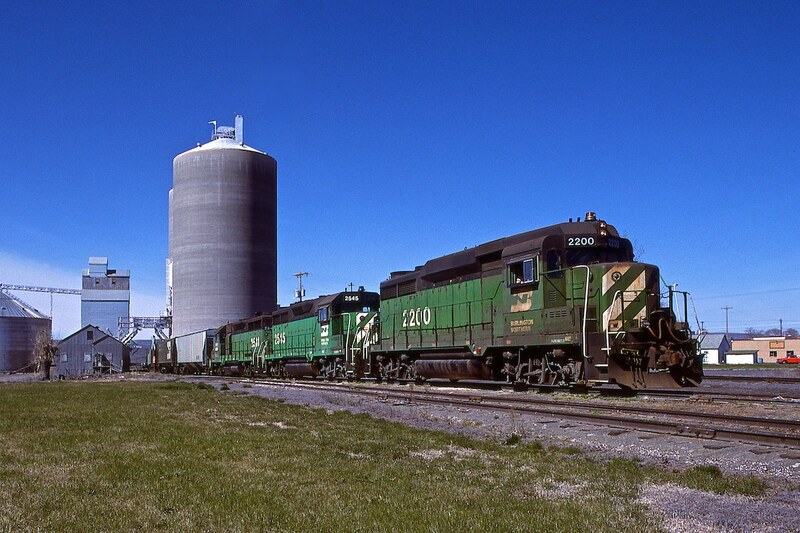 The line is now operated by the Eastern Washington Gateway Railroad and continues to serve its purpose of getting grain to market for some of the smaller Eastern Washington grain producers. Photo taken in Coulee City, WA on March 29, 1987."